A $1,000 SCHOLARSHIP HAS BEEN ESTABLISHED TO RECOGNIZE A HIGH SCHOOL SENIOR RESIDING IN CLINTON, PLANNING TO FURTHER THEIR EDUCATION, WHO ARE INVOLVED IN SCHOOL AND COMMUNITY ACTIVITIES, HAVE PARTICIPATED IN CLINTON LITTLE LEAGUE AND HAVE DEMONSTRATED PERSONAL RESOURCEFULNESS IN HELPING TO FUND THEIR EDUCATION. ADDITIONAL CRITERIA & ELIGIBILITY: Candidates must show satisfactory academic performance and have a good academic standing. The applicant must intend to pursue their education in a school of higher learning such as a college or university, technical, vocational or business school. A short essay (of no more than 250 words) must accompany this application, outlining the need for the scholarship. Also include anything else you would like the scholarship committee to consider. A letter of recommendation is strongly encouraged but not required. APPLICATION DEADLINE:Please return a completed application to Janet Theiler at The Morgan School by April 24, 2019. 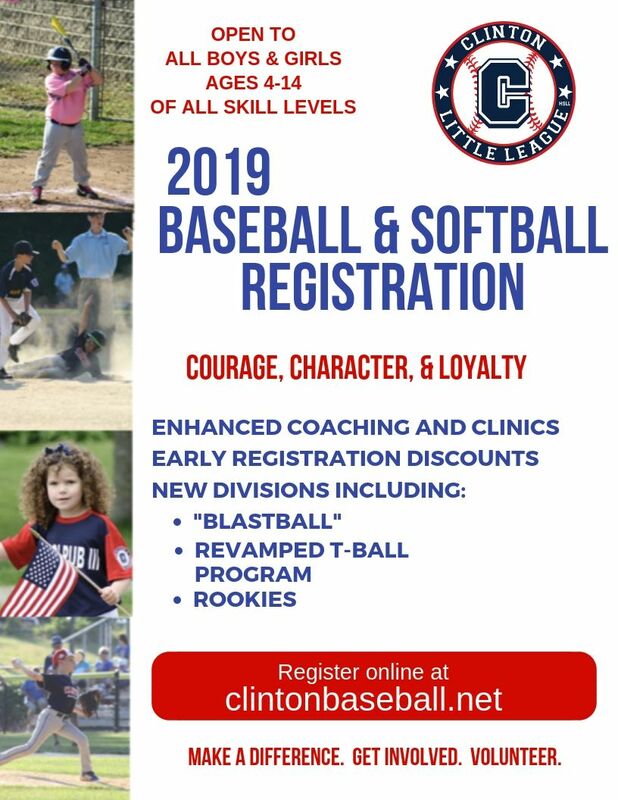 Clinton Little League Baseball Winter Clinics will be held at the Shoreline Baseball Academy. There will 2 sessions for 6 weeks with limited availability based on age group. Softball Winter Clinics will be held at the Shoreline Baseball Academy. Clinic will be for 6 weeks.